The Tamil Nadu Directorate of Government Examinations (TNDGE) is going to conduct public examination also for 11th standard. So the School Education Board release the Tamilnadu 11th question paper pattern and model question papers in pdf. Students needs to download previous year question paper with answers and prepare for your state board plus one public exam to get good marks. We provided the class 11th question bank including one mark questions with answer for all subjects below. The Tamil Nadu State Government has introduced public board examination for HSC first year with new exam pattern. From now on 11th standard exam marks also very important for higher studies in medical, engineering, etc. So students should prepare for your samacheer kalvi public exam with full effort. Download the TN 11th study materials online for all groups such as Maths, Biology, Commerce, Computer Science, and Vocational. Plus One New Model Question Papers 2017-2018 has been published by School Education Minister K. A. Sengottaiyan on 18-08-2017. TN Model Question Papers 2018 available for 23 General Subjects including Tamil & English and 13 Vocation Subjects. CD / DVD which contains 54,000 questions with answers for competitive exam will be given for students soon. You can also download quarterly, half yearly and annual exam question papers by year wise as a pdf file. Note: 11th standard public exam plan is changed. New plus 1 questions paper pattern is only for 600 marks including aural & oral test, practical and theory exam. You should solve all the previous year question papers as much as possible. Before quarterly, half yearly and annual exam, workout with same previous year question at least one time. Tamil Nadu state board class xi objective type of questions or 1 mark questions are also available to download. Try to answer for all the questions correctly. 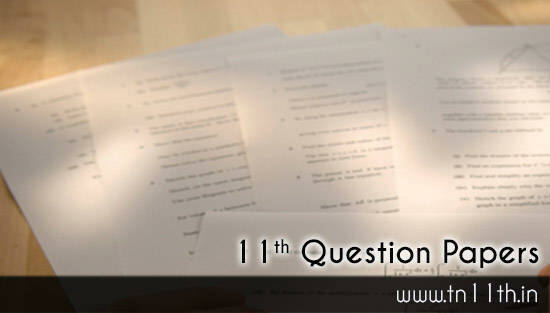 We will also update the 11th attempt exam question papers on this page. The TN DGE should also conduct the plus one (+1) supplementary exams in the month of June/July and September/October. To download as pdf file search for your medium Tamil or English and then click one download link particular subject like Mathematics, Physics, Chemistry, French, Accountancy, Economics, etc. Note: Keep in mind that the above given all previous year question papers are designed for 3 hours and totally 150 marks (subjects which have practicals) or 200 marks (subjects which does not have practicals). As per the new question pattern, upcoming plus 1 exam question papers should be designed for 2:30 hours and totally 100 marks.